Jay Asher, author of Thirteen Reasons Why (a fantastically poignant young adult novel), writes the forward for Positive. In it, he introduces the reader to Paige Rawl, a girl whose upcoming story he promises will change the way we think about how we treat those around us. As with most teenagers, Paige was excited to start middle school, excited for the new freedoms, challenges, and changes of growing up, making new friends, and trying new things. But there was something about Paige that set her apart from the rest of the kids in her school: Paige was born HIV positive. Nineteen-year-old Paige Rawl bravely tells her true-life story. Her memoir is moving, powerful, and important. 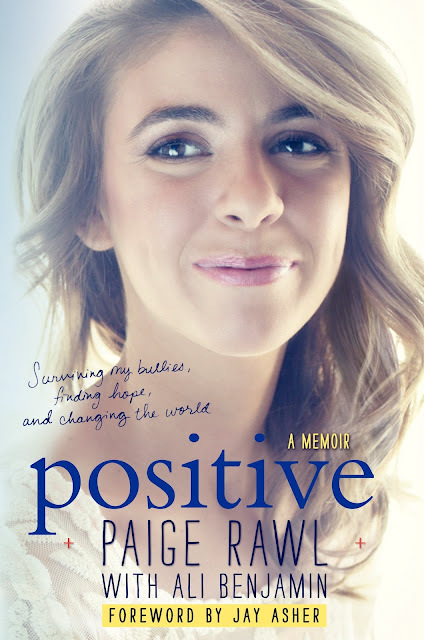 At a time when it is more important than ever to teach kids about the evils of bullying, Paige shares her experiences as her best friend turns on her, joining the throngs of teenagers, teachers, coaches, school administrators, and community members who take it upon themselves to make her feel that she is different, bad, and unwelcome. Though Paige's mother is an amazing source of strength to her--making sure she takes her medicine everyday, continually being her support and defender--even she cannot protect Paige from the cruelty hurled at them both. Paige endured name-calling, physical violence, isolation, bullying, ostracism, and threats against her life. When Paige has to leave school due to the physical, mental, and emotional toll bullying is taking on her, she hopes to move on but soon finds herself locked in a bathroom, taking one sleeping pill for every year of her life. She survives, keeps fighting, and should be praised for sharing her story. I loved reading Positive. The book is immediately engaging, Paige's story is profound, and she's a great role model for others in need of the strength to fight against bullies and prejudice. You can read more about Paige, her role in HIV/AIDS education and activism, public speaking, and advocacy against bullying at her website www.paigerawl.com.